Laura Carlin’s work is sensitive, thoughtful, and beautiful. You’ve probably seen her illustrations for The Promise, by Nicola Davies and for The Iron Giant, by Ted Hughes. She also creates fantastic editorial work for publications like The New York Times and creates beautiful ceramics. With her author-illustrator debut, A World of Your Own, Laura adds a nice dose of humor to the mix. Today she tells us all about it. The cover for A World of Your Own by Laura Carlin. Tools of the trade: colored pencils, watercolors, acrylics. I’m inconsistent with what I buy. It depends on my finances as to the quality of the tools! Workspace: At home and in a studio in Camberwell, South London. Pets: In my head I’ve got about 40 kittens. Favorite thing to read: Slightly depressing American books written in the 40s/50s. Robin: Is this the first book that you’ve written AND illustrated? Robin: Where did the idea for the book come from? Laura: The conversation with Phaidon started with the idea of producing a book teaching children to draw. This didn’t sit well with me because there are already several books that do a great job of this and – perhaps more importantly – children are far better at drawing than adults! Of course children become insecure and want their artwork to look ‘right’ but within the book I wanted to push the idea that you don’t see things in the same way as everyone else – just as your ideal house, pet and flag are different, so are the ways in which you make them. I also tried to help encourage this by starting with the Real World – getting the reader to look around them and let that spark off ideas and projects. The idea that artwork could have ideas behind it determining how it looked, as well as the fact that one person’s drawing should look different from another’s are strong themes that I hope come through in the book. Robin: How was the process of writing for you? Which came first: images or words? Were you writing and sketching simultaneously? Laura: I wanted the visuals to come first because that’s where I think my strength lies. But I just kept producing over-complicated and confusing stories – I found it too hard to edit drawings and paintings. Whether I liked it or not, the words had to come first, even if inspired by a couple of visuals; they formed the thread and overall structure of the book. Robin: I love how the book models creative thinking for both kids and adults. You pose a question (What could be inside this scary house?) and then answer it in such an original and unexpected way (131 cats!) Is this is a way of thinking that comes naturally to you? Can you touch on your process for asking and answering these questions for yourself? Laura: I think parts of the books such as the scary house come from when I’m feeling relaxed. It’s far harder than it sounds to write and illustrate for children and remain relaxed! You keep wondering what a child might like and trying to manipulate the story to be what you think it should be. The best children’s writers and illustrators are in touch with a playful and imaginative side of themselves, it isn’t something to put on. Robin: I love all of the collaging and 3D work in the book. It looks like you did a lot of playing and experimenting. Why did you decide on this eclectic visual approach for this book? Was it a conscious choice at the beginning of the process or did it evolve as you were working? Laura: It definitely evolved. When the book started, I got into making pretty pictures using watercolor and colored pencils to illustrate my ideas and my world. Standing back from them, I realized that using my way of working throughout just excluded the reader – it would only really appeal to children who liked using the same tools. Some sketches that didn’t make it into the final book. And a few more sketches that didn’t make it in. Robin: Your work is so loose and full of energy. What was your process like from the sketch to the finished piece? Laura: There are many, many, many drafts of this book! But this was about trying to get the idea and thread of the story correct. When it comes to actual artworks, I work on a few versions of the same spread at the same time. This is to try and stop the pressure of creating the perfect piece, which I know a lot of illustrators suffer from. I don’t tend to do roughs and finals – I try to retain the energy by working in this way but treating all pieces as if they’re going to be used. Endpapers for A World of Your Own by Laura Carlin. Robin: The endpapers are great. At what point in the process did you come up with the idea for those? Robin: A technical question… did you take your own photographs of the 3D pieces? Do you have a seamless still life area set up for this? Laura: I tried. I was very naïve to think that I could take professional photographs! Through using photographed sets in my previous book, The Iron Giant, I met a brilliant pair of photographers, Dominic Lee and Chiara Meattelli, They are not only very patient with my various characters; they are sympathetic to the idea of 2D and 3D working on the same page. Robin: Do you have any friends or colleagues with whom you share your in-progress work in order to get feedback as you work? Laura: I am very lucky to have a husband who is also an illustrator [Luke Best]. He is my best critic and a very thoughtful observer. I really take his opinions on board. I also have some fantastic illustrators as friends but I try not to talk work too much with them – it’s good to escape. Robin: Is there anything else you want to share about the process of making this book? Laura: I just really hope children – and adults – enjoy it! Thanks Laura! You can see more of Laura’s work at the Heart Agency website. 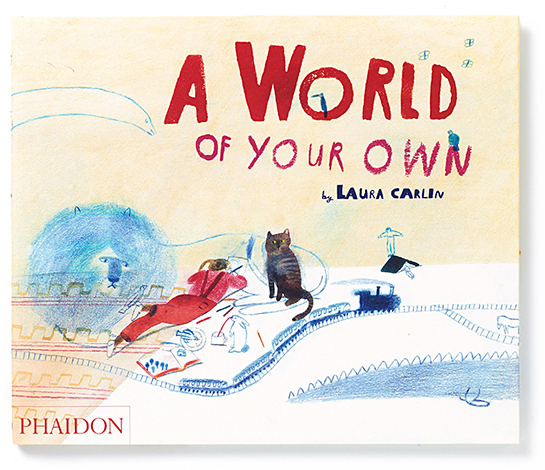 A World of Your Own by Laura Carlin: a collage of 2D and 3D elements on one spread. Brilliant, and made me tear up – remembering how hard it was to teach kids with the director looming, demanding to know why the pieces didn’t all look the same. I didn’t last. Hats off to Laura on this wonderful accomplishment! Can’t wait to share this with budding artists too! Wonderful interview with a true talent! Previous PostA Pen & Oink interview with the great Sara Varon!